I have finished Icon Dress! Hurray, hoorah, hip hip huzzah and so on! 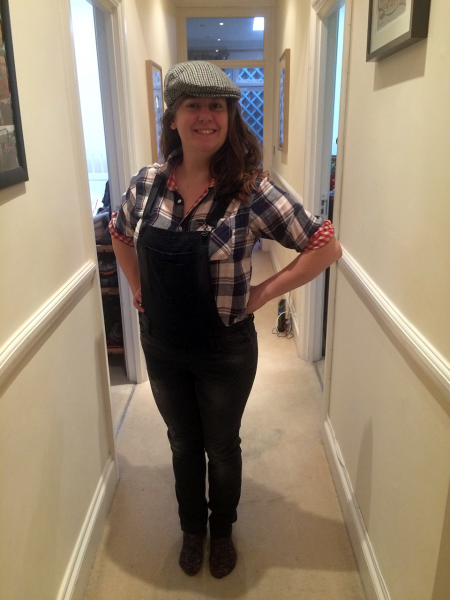 (Sorry, I’m feeling a bit quirky today…I’m wearing dungarees and they’ve got to my head a bit.) I cast off, seamed up and picked up my stitches, and finished it on October 15th. I am so, so pleased to have completed it! I cast on in June, and was convinced that I would never finish it. 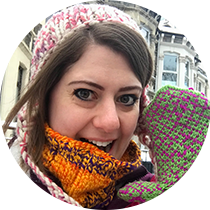 I don’t know what got into me, but when Louise from Knit British announced that she was hosting a WIPAlong with Nic of Yarns from the Plain, I decided to get on board. I was stunned at how much I could get done with a few hours of really concentrated work. I’m going to give you all a reminder of the what is what with the Icon Dress. 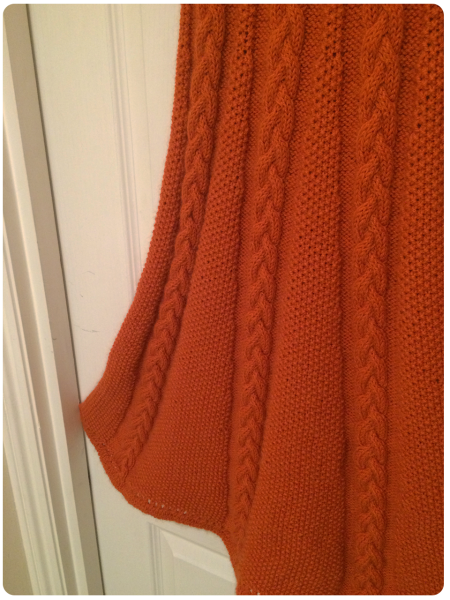 The designer is Kari-Helene Rane and the company Purl Alpaca Designs. You can get the pattern and knitting kits from their website. The yarn is John Arbon Textiles Knit by Numbers in colourway number 14. A double-knitting yarn, it is advertised as 100% merino. 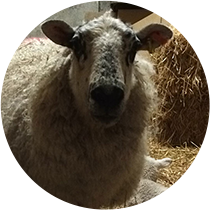 It caused some consternation at Loop, as we all wondered whether it was actually alpaca. It’s very drapey. This made me wonder if the dress was going to be too drapey and stretch out of shape…until I remembered the recommended yarn is alpaca yarn. Everyone knows that that is not at all drapey…right? So I carried on regardless, and I’m thrilled that it is done. I have not blocked the dress yet, as I need the spare bed to do this and my mum is coming to stay. I will have to wait until Tuesday to do the blocking, which is OK.
I’m going to Barrow to visit friend Dan for Halloween, and I will ask him to take nice photos with his nice camera for me. For now, you will have to make do with my iPhone photos! Showing the flare on the skirt too. 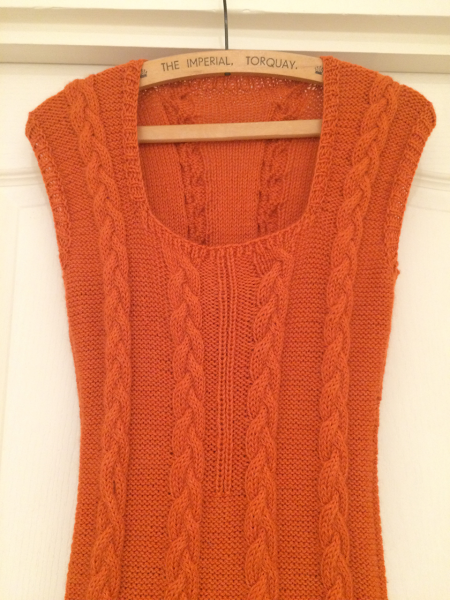 The bodice – still needing buttons, but that is fine. Showing the flare of the Icon Dress. 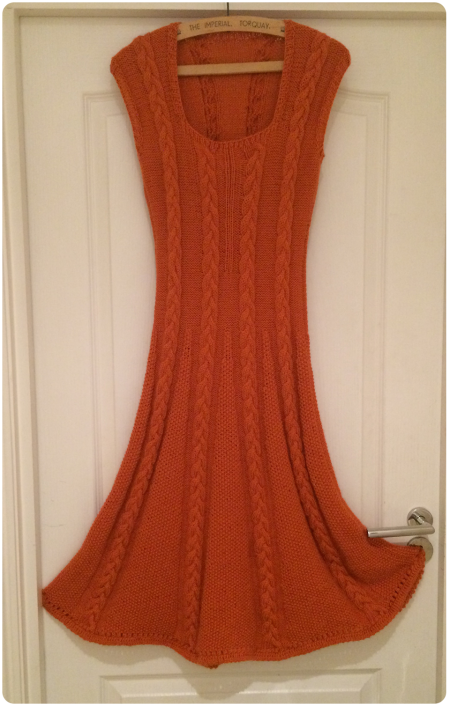 The full dress on a hanger. Dungarees. I wear dungarees now. 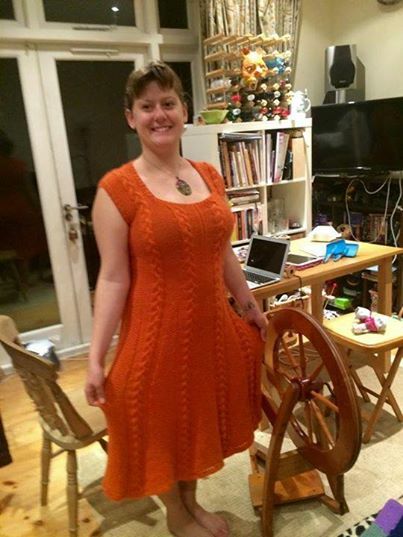 This entry was posted in FOs, Knitting and tagged Dress, Finished Object, Icon Dress, Knitting, Purl Alpaca Designs. Bookmark the permalink. It’s gorgeous!! Kudos for finishing, I would have lost interest halfway through. Lordy. That is breathtaking on you. The color is also very flattering. How does it wear? Is hot and heavy? Light and warm? I’m interested to know. I am in LOVE with this dress! OMG! Ok, you had me at the color orange but seriously, that dress is so flattering and gorgeous. Great job on your icon dress. That is quite an accomplishment and so pretty you are wearing it. Wow, that looks great, well done! It is a lovely pattern and suits you really well. I would love to knit something like that, but it would probably take me years, well done for finishing so quickly! ‘WIP Crack Away’ seems to have inspired a lot of people. Love the dungarees too, I have never been able to find any that fit me! I am enjoying your podcast, keep up the good work! Hurrah! The dress is really fabulous looking. Kudos for having finished it! Double top marks for that. Suits you well.